Bird shot, tear gas and truncheon-wielding riot police are not the normal accompaniments to a Grand Prix weekend. Heavy with corporate sponsorship and shielded from the ongoing riots and bloodshed, the most wealthy of motorsports has arrived in the tiny archipelago state of Bahrain. This Persian Gulf Kingdom has been shaken by more than a year protests and civil disorder that threatened to dethrone a fifty year old dynasty. At least 35 people died last spring in events that caused the cancellation of the 2011 Grand Prix. Calls for the race to be cancelled this year too have not been heeded. Bernie Ecclestone, who owns the rights to the sport, declared Bahrain was ‘quiet and peaceful’ as the teams and Bahraini government debated cancelling the event. Bahrain assured all the drivers and teams would be safe. But members of racing team Force India have already opted to leave Bahrain after they had a brush with some protesters carrying petrol bombs. F1 is a multi-million pound business with highly lucrative sponsorship and broadcast rights. To cancel a race would be quite a financial hit. Ecclestone said F1 is honouring an obligation in holding the race in the Kingdom, passing the buck to the Bahraini government. An Amnesty International report declared ’not much has changed in the country since the brutal crackdown began’ in February 2011. There is a strong feeling the three day Grand Prix is being used by Bahrain to improve its public image, with the help of some British and American PR firms. The Kingdom’s reputation took a hit last year as people took to the streets across the Arab world. Revolutions were televised to an awestruck global audience and what started in Tunisia spread across north Africa and the Middle East. The Bahrainis, majority Shia but ruled by the Sunni Al Khalifah family since 1961, began protesting on February 14. 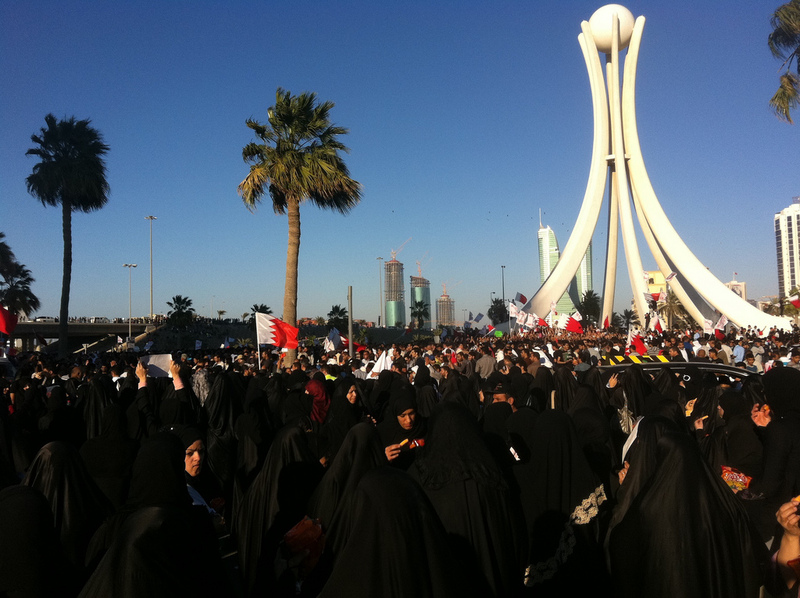 Tens of thousands marched through the capital Manama demanding greater democracy and an end to sectarian discrimination. The government’s response was brutal. Seven people were killed by security forces in the first week of protests. 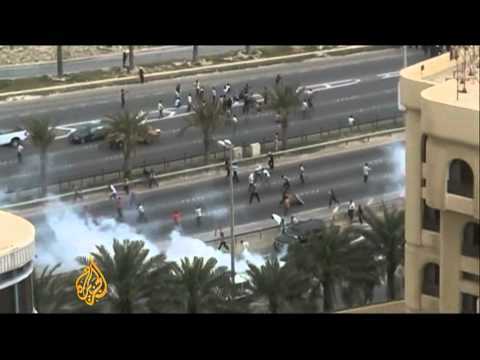 Shotguns, live ammunition and teargas were used to disperse citizens camped out in the Pearl Roundabout. The roundabout and its monument was to become the totemic rally point for Bahrainis, like Tahrir Square in Cairo for Egyptians. Long after Egyptian and Tunisian protesters had succeeded in unseating their authoritarian rulers, King Hamad seemed relent in the face of his own subjects ire. As February drew to a close 23 imprisoned protesters were released. Allegations of torture were swift to follow. Hopes of reconciliation and reform, though, were short lived. In early March negotiations between the ruling family and opposition leaders broke down. In the second week of March peaceful protesters return to the streets. Now reform was no longer good enough. Some were openly demanding their King abdicate and Bahrain become a republic. Sectarian violence followed and two Asian migrant workers were killed when anti-government protesters set upon them. Crowds demanding the overthrow of their government sealed off roads in the capital, occupying the financial district and Pearl Roundabout. In response, on March 15 Saudi Arabia sent 1,200 police and soldiers into their neighbour and the King of Bahrain declared a state of emergency. Called a State of National Safety, it gave the security forces draconian powers. The next day security forces with tanks and helicopters evicted protesters from the Pearl Roundabout. Amnesty reports that at least two protesters and two police officers were killed. The roundabout’s monument was torn down and the area blockaded by troops and police. The crackdown brought the protests to an end with hundreds of people arrested and many charged in military courts to the anguish and outrage of human rights groups. Throughout the rest of the Arab Spring, Western governments were vocal in their condemnation of state brutality towards protesters. In Libya Nato intervened militarily helping rebels overthrow Muammar Gaddafi. But on Bahrain they remained mute. Cries of hypocrisy and complicity rang out but the likes of Britain and America, which has its Fifth Fleet headquarters in Bahrain, stayed silent. There was no rallying cry from the West even when, as the Pearl Roundabout was cleared of protesters, Bahrain security forces sought out and targeted medical and paramedical staff. Human Rights Watch (HRW) recorded a litany of assaults on medical neutrality as security forces attacked medics treating injured protesters on the scene, besieged and invaded the country’s main hospital, targeted patients with protest related injuries – like pellet wounds delivered by shotgun toting police – and arrested medical staff. At least 47 medics and paramedics were tried in the specially convened military court the National Safety Court. During their time waiting for trial many of these medical staff alleged torture and abuse. Their lawyers were not allowed to see them, they were charged with crimes including embezzlement of public funds, attempts to occupy buildings by force and dissemination of false news against the public interest. An anonymous government official, ‘familiar with what happened,’ flatly rejected the allegations when questioned by HRW. The military court sentenced 13 doctors and nurses to 15 years. Another seven were jailed for between five and 10 years. In June 2011, the state of emergency was lifted and in September by-elections were held to replace the Shia MPs who had quit the parliament, objecting to the violent treatment of protesters.